Some weeks ago we gave some news of Graafship with Ingomar, today it's the turn of Wolfhound, an impressive schooner started at the beginning of the year. A contrast from Ingomar, Wolfhound is not a replica, but an original design by John G Alden, hull No. 327, which Alden drew for himself in 1927 but was never realised. Without spars, Wolfhound has a length of deck of 36.9m. The preliminary design indicated that she would be built in wood, but to be Lloyd's A1 registered and available to the charter, it was decided to build her in welded steel. The rig opened another question, too, Alden having established a two-masted and a three-masted version. 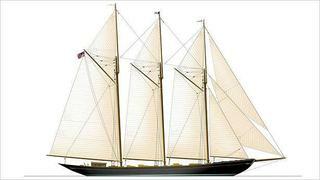 The latter was chosen, deeming the three-masted version more spectacular. The preliminary design from Alden didn't give details for the construction. Niels Helleberg, who worked at Alden Design during many years, established the naval architecture in the spirit of the 1920s. The structural design is by Paul Wester, while the interior design, accommodating up to 12 guests, is by the in-house team at Graafship. The three-masted rig will have a total sail area (lowers and uppers) of 695sqm, and in case of light wind, power will come from a 475hp MTU engine giving a top speed of 12.9 knots, a range of 3,900 nautical miles at eight knots.